Not to be confused with Jonathan Mensah or John Mensah Sarbah. John Mensah (born 29 November 1982) is a Ghanaian professional footballer who plays as a defender for AFC United in the Swedish second-tier league. Mensah spent the 2009–10 and 2010–11 seasons on loan at English club Sunderland in the Premier League. Born in Obuasi, Ashanti, Mensah is a product of the scouting system in Ghana that identifies talented youngsters long before they enter any formal structures and exports them to potential fame and fortune in Europe. A centre-half by choice, Mensah is also adept at right-back and has played in both positions for his national side, also captaining the team on occasions. His physique has earned him the moniker the "Rock of Gibraltar", and Mensah was considered a certainty to be named to Ghana's squad for the 2006 FIFA World Cup. Mensah's first foreign adventure was as a teenager when he moved to Italy to join Bologna. The Serie A outfit recognised his talent, but also saw that his was potential in its rawest form and, as such, loaned him to Swiss side Bellinzona, where it was hoped that he would hone his talents. Mensah's lack of speed was the reason many scouts overlooking his talent but he has shown great positioning and awareness. The arrangement proved beneficial to both clubs and also to the player himself, and it was during his time in Switzerland that Mensah was called up for the 2001 FIFA World Youth Championship in Argentina, where Ghana finished as runners-up to the host nation in the tournament. The following season, he returned to Serie B on loan with Genoa before being permanently purchased by Chievo in summer 2002. A brief spell with Modena punctuated a moderately successful three-year stint in Verona. However, following another uneventful move to Cremonese in Serie B, Mensah came to the conclusion a new stable environment was what was required to kick-start his somehow journey-man career. On 31 January 2006, during the winter transfer window, Mensah moved to French Ligue 1 club Rennes on loan after having played in Italy for most of his career, at the behest of their former player Philippe Redon, who brought him to fill the gap in defence caused by an injury to another African, the Moroccan Abdeslam Ouaddou. High-level performances in the league convinced Rennes to make the loan deal permanent – in In April 2006, he signed a three-year contract with the side. The move to Rennes earned Mensah a reputation in France as one of Ligue 1's top defenders..
John Mensah captaining and playing for Stade Rennais. On 28 September 2006, Rennes' club website wrote an article on Mensah's impact on his new team. It said, "The summary from 11 February 2006 to 28 September 2006: 18 games: 12 wins, 5 draws, 1 defeat. 12 conceded goals, 4 of them when Mensah was not on the field. Rennes conceded 0.66 goals per game with Mensah. Without Mensah Rennes had 6 games, 0 wins, 1 draw and five losses. 13 goals were conceded, making 2.66 per game." On 17 May 2007, Mensah signed a contract extension with Rennes, lasting until 2010. "I am very lucky to be able to stay one year more with such an ambitious club, especially since a lot of clubs wanted me", Mensah told L'Équipe. Rennes head coach Pierre Dréossi said, "Those who wanted to see him at another club can now forget my telephone number." Mensah was linked with Portsmouth, which also looked likely to be his future destination due to strong presence of African players, along with his international teammate Sulley Muntari at the club. Mensah was also linked with a transfer to Wigan Athletic. An enquiry from Wigan for the Ghanaian was welcomed by Rennes, with assistant coach Philippe Redon commenting it would take at least £7 million to prize the "Rock of Gibraltar" from the club. Mensah played 58 total Ligue 1 matches for Rennes, scoring two goals, against Troyes in 2005–06 and Toulouse into 2007–08. He also played three matches in the Coupe de France, two in the Coupe de la Ligue and two in the UEFA Cup. He was made Rennes' team captain in January 2008 until his exit that summer. Following his departure, Rennes head coach Guy Lacombe lamented he had hoped to keep his captain because his exit will mean a re-examination of their playing system and that, "[H]e will not go to an average club. If John leaves, he will do it only for something that one cannot propose to him here." On 26 April 2007, it was reported in the French media  that Mensah was being seriously scouted by Lyon, with a view to making a move for him in that summer's transfer window. As of November 2006, Mensah was rated the number 1 player in France by France Football magazine, level with Juninho, in the 2006–07 season's "Top 100 French League players", but injuries ruined his season and his stats were taken off this page later on. On 18 June 2008, new Lyon head coach Claude Puel made it his priority to sign Mensah to replace centre-back Sébastien Squillaci, who departed to Sevilla in La Liga. Negotiations continued for the following four weeks, and on 15 July 2008, Lyon's special adviser Bernard Lacombe contacted Mensah and negotiated a five-year contract with him. However, Rennes dismissed Lyon's initial interest. Lyon club owner Jean-Michel Aulas offered the Breton club only €6 million, a figure that did not appease Rennes general manager Pierre Dréossi. But the French media said Mensah will sign for Lyon in an €8 million transfer. On 21 July 2008, Mensah finally signed a five-year contract with Lyon in an €8.4 million transfer. He was presented to the media at 20:00 that day. During the press conference, Aulas stated Mensah was recommended to them by ex-Lyon midfielder Michael Essien. Mensah took the number 15 shirt, and became the third Ghanaian player to ever play for Lyon, after Abedi Pele and Essien. Mensah made his Lyon debut on 13 September 2008 in a 3–2 win over Nice. However, his time at Lyon was difficult over being rarely used, having suffered tearing his groin muscle and never played in his truly position. Instead, he played in left (with the absence of Fabio Grosso) or right-back (with the absence of Anthony Réveillère and François Clerc.) Mensah spent the second half of the season on the substitutes' bench or out injured. In a 3–1 win over Le Havre on 15 February 2009, Mensah was racially abused by Le Havre fans when he was targeted during the pre-match warm-up and throughout the first half. Lyon head coach Claude Puel insisted he should stay on the field throughout the match, only to receive a red card after a second bookable offence. After the match, the club expressed outraged over racial abuse on Mensah. Mensah spoke out about racism and told L'Équipe it not only left him homesick, but also affected his career. A Le Havre fan, who racially abused Mensah, was later charged for making racist insults after being arrested by the police and was released on bail. If convicted, he risks up to six months in prison and a fine. The fan, aged 21, admitted his actions and eventually, the fan was presumed innocent pending further investigation. His sending-off was upheld and miss one match ban by the Ligue de Football Professionel Disciplinary Committee. Their action received criticism from critics, and that the referee Alain Hamer was treating Mensah harshly. In the last match of the Ligue 1 season, Mensah once again received a red card after a second bookable offence when he made a dangerous tackle on André-Pierre Gignac in 0–0 draw against Toulouse. That season, Lyon ended its seven-year streak of winning the Ligue 1 championship, placing third behind champions Bordeaux and second-placed Marseille. After one season, Mensah announced his intention to leave the club. On 15 August 2009, various sources in France reported Mensah would be joining English Premier League club Sunderland on loan for the season, with the club also having the option to permanently purchase the player for €7 million after the season. On 21 August, Mensah successfully passed his medical and, one week later, was awarded his work permit by the Court of Arbitration for Sport, officially completing the move. Mensah made his debut for Sunderland on 12 September, coming on as a substitute against Hull City in a 4–1 win. He then made his full debut in the 2–0 League Cup win over Birmingham City on 22 September and even managed to put the ball in the net, although it was disallowed for a foul on Blues goalkeeper Maik Taylor. Mensah scored his first Sunderland goal against Manchester City on 19 December. So far Mensah's season with Sunderland has been hampered with the constant reoccurrence of a calf injury. Notwithstanding, teammate Michael Turner described Mensah as the best defender he has ever played with. Mensah became a favourite amongst the Sunderland faithful, but his injury problems meant he would struggle to play much in the upcoming season. Mensah rejoined Sunderland on loan for the 2010–11 season on 11 August. Upon rejoining Sunderland, Mensah was handed the number 5 shirt on the eve of the new season, the same number he wore internationally for Ghana. Mensah started Sunderland's first match of the season, a 2–2 draw against Birmingham City. However, injuries and the form of Titus Bramble and Michael Turner kept Mensah out of the starting line up until Sunderland's victory against Stoke City on 6 November 2010, where he replaced the suspended Bramble. Mensah received a straight red card in a match against Liverpool on 20 March 2011 after a foul on Luis Suárez, although the card was later rescinded. On 9 April 2011, Mensah suffered a Grade Two adductor tear just 11 minutes into Saturday's 3–2 home defeat by West Bromwich Albion, casting doubt on his future at Sunderland. Mensah was out of actions for three weeks until he made a return as an unused substitute in a 3–0 defeat to Fulham. Mensah made his return against Bolton Wanderers in a 2–1 win as his Ghanaian teammate Sulley Muntari scored a winner in a 90th minutes, but Zat Knight scored the own goal. Mensah made his last appearance for Sunderland in a 3–1 loss against Wolverhampton Wanderers on 14 May 2011. Following Sunderland's loss, Mensah and Nedum Onuoha had a furious dressing-room bust-up after Onuoha criticised Mensah's display, sparking a confrontation in which the two had to be separated by teammates to stop it escalating. However, Sunderland manager Steve Bruce opted not to sign Mensah permanently because of his persistent injury problems, therefore Mensah returned to Lyon. Previously, Mensah's loan contract included an option that the loan would be made permanent should Mensah appear in at least 25 Premier League matches. Mensah returned to his parent club Lyon in August 2011 after spending the 2009–10 and 2010–11 seasons on loan at Sunderland. On his return from Lyon, he made one appearance, on 8 July 2011 in a 1–0 friendly loss to Red Bull Salzburg, where he conceded a penalty for a foul and was subsequently issued a red card. After making one appearance, he was rarely used during the 2010–11 season due to injuries, and did not play a single match at Lyon that season. On 8 July 2012, Mensah was released from the club after terminating his contract. After being released, Mensah was linked with moves to Bordeaux, Trabzonspor, Celtic and West Ham United. On 2 January 2013, after having his Lyon contract terminated, Mensah returned as a free agent to Rennes, signing a six-month contract. He was issued the 25 number shirt. Mensah made his "second debut" with Rennes in a 2–1 Coupe de France defeat to Lens. However, after only four appearances in his second spell, he left the club after his future was uncertain. Mensah made his Nitra debut on March 2014 in a match against Slovan Bratislava. John Mensah playing for Ghana at the 2008 Africa Cup of Nations. Mensah's senior debut for Ghana was against Algeria on 5 December 2001, just after his 19th birthday, on the eve of the 2002 African Cup of Nations finals in Mali, a tournament at which his aerial ability was a prominent feature of Ghana's play. Since then, Mensah has been a regular for the national team, playing almost every match since, rising in the rank of importance to become the assistant-captain of the national team and now has 42 caps as of 27 March 2007. Mensah played for the Ghana Olympic team, known as the Black Meteors, in the 2004 Summer Olympics. In 2006, he participated in his second African Cup of Nations tournament in Egypt, and was solidity personified during Ghana's successful qualifying campaign for the 2006 FIFA World Cup. 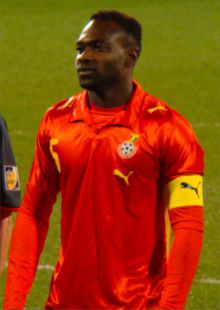 Mensah was selected in the 2006 African Nations Cup All-Star Team of the Tournament by the Confederation of African Football in February 2006. He was also involved in the 2006 World Cup with his national side. Ghana finished in second position in Group E following a 2–1 victory over the United States in their final group match. After the final whistle, Mensah lifted his team jersey to reveal a T-shirt displaying "John Mensah – Rock of Gibraltar", his nickname in Ghana. However, in the round of 16, Ghana was eliminated by 2002 World Cup winners Brazil, 3–0. Ghana's head coach at the World Cup, Ratomir Dujković, would later cite Mensah for high commendations after the tournament. On 3 February 2008, Mensah was sent off in a 2008 Africa Cup of Nations quarter-final match against Nigeria for a professional foul against Peter Odemwingie. Ghana nonetheless won the match 2–1 with goals from Michael Essien and a later winner by Junior Agogo. Mensah captained Ghana to an impressive quarter-final finish at the 2010 World Cup, where the Black Stars were eliminated on penalties by Uruguay following a 1–1 draw after extra time. John is the half brother of Ghana national team player Ekow Benson. ^ Hugman, Barry J., ed. (2010). The PFA Footballers' Who's Who 2010–11. Mainstream Publishing. p. 285. ISBN 978-1-84596-601-0. ^ "Chievo land Ghanaian". Sky Sports. 11 June 2002. Retrieved 6 January 2013. ^ "Profile of John Mensah". ghanafa.org. 1 January 2007. Archived from the original on 13 February 2007. Retrieved 2007-01-01. ^ "Mensah, homme providentiel". stade-rennais-online.com. 28 September 2006. Retrieved 2006-09-28. ^ "Rennes: John Mensah prolonge d'une saison supplémentaire". staderennais.com. 17 May 2007. Retrieved 2007-05-17. ^ "Mensah snubs Royals". eurosport.com. 17 May 2007. Retrieved 2007-05-18. ^ "Harry plans Mensah move". Sky Sports. 9 April 2008. Retrieved 6 January 2013. ^ "Mensah in Pompey link". Sky Sports. May 2008. Retrieved 2008-05-20. ^ "Mensah met les voiles à Lyon, un casse-tête pour Lacombe..." rennes-infhonet.fr. 21 July 2008. Retrieved 2008-07-21. ^ "Rennes : J. Mensah – on a de l'espoir". news.maxifoot.fr. ^ "Rennes : J. Mensah – "on a de l'espoir"". maxifoot.com. 26 April 2007. Retrieved 2007-04-26. ^ "OL : Puel veut Abidal ou Mensah". mercato-blog.football.fr. 18 June 2008. Archived from the original on 19 June 2008. Retrieved 2008-06-18. ^ "Lacombe contacte Mensah". transfert2foot.com. 15 July 2008. Archived from the original on 18 July 2008. Retrieved 2008-07-15. ^ "Colossus Mensah Nears Lyon Deal". goal.com. 17 July 2008. Retrieved 2008-07-17. ^ "Lyon : Ce sera Mensah". ouest-france.fr. 17 July 2008. Archived from the original on 18 July 2008. Retrieved 17 July 2008. ^ "ARRIVAL OF JOHN MENSAH" (PDF). OL Group. 22 July 2008. Retrieved 9 February 2012. ^ "Lyon : Mensah va signer". football365.fr. 21 July 2008. Archived from the original on 23 July 2008. Retrieved 21 July 2008. ^ "Mensah est Lyonnais !". football.fr. 21 July 2008. Archived from the original on 24 May 2012. Retrieved 21 July 2008. ^ "Mensah suffers injury setback". Sky Sports. 29 October 2008. Retrieved 6 January 2013. ^ "Mensah abuse angers Lyon". Sky Sports. 16 February 2009. Retrieved 6 January 2013. ^ "Mensah shocked by racism". Kick off.com. 15 March 2009. Retrieved 6 January 2013. ^ "Lyon Defender John Mensah: Racist Abuse Made Me Yearn For Ghana". Goal.com. 17 February 2009. Retrieved 6 January 2013. ^ "Fan charged over Mensah abuse". BBC Sport. 18 February 2009. Retrieved 6 January 2013. ^ "No Leniency For Lyon's Racial Abuse Victim John Mensah". Goal.com. 20 February 2009. Retrieved 6 January 2013. ^ "Lyon duo set for exit". Sky Sports. 31 July 2009. Retrieved 6 January 2013. ^ "Mensah a Sunderland". Mercato365. 15 August 2009. Retrieved 15 August 2009. ^ "Man City 4–3 Sunderland". BBC Sport. 19 December 2009. Retrieved 20 December 2009. ^ "Sunderland re-sign Lyon defender John Mensah on loan". BBC Sport. 11 August 2010. Retrieved 11 August 2010. ^ "Red card for Sunderland's John Mensah against Liverpool rescinded". The Guardian. 22 March 2011. Retrieved 6 January 2013. ^ "Sunderland 2 – 3 West Brom". BBC Sport. 9 April 2011. Retrieved 9 April 2011. ^ "Mensah's injury problems put permanent Sunderland switch in jeopardy". Daily Mirror. 12 April 2011. Retrieved 12 April 2011. ^ "Sunderland 0 – 3 Fulham". BBC. 30 April 2011. Retrieved 30 April 2011. ^ "Bolton 1 – 2 Sunderland". BBC. 7 May 2011. Retrieved 7 May 2011. ^ "Sunderland 1 – 3 Wolverhampton". BBC. 14 May 2011. Retrieved 14 May 2011. ^ "Sunderland defenders Nedum-Onuoha and John-Mensah bust-up following loss to Wolves". Daily Mail. 17 May 2011. Retrieved 17 May 2011. ^ "Sunderland pass on deal for John Mensah". Chronicle Live. 26 May 2011. Retrieved 26 May 2011. ^ "Agent – No Mensah deal". Sky Sport. 4 April 2011. Retrieved 4 April 2011. ^ "RED BULL SALZBURG – OL, RELIVE THE LIVE! (in French:RED BULL SALZBURG – OL, REVIVEZ LE LIVE !)" (in French). Official Site of Olympique Lyon. 8 July 2011. Retrieved 6 January 2013. ^ "Ghana's Mensah leaves Lyon over injuries on 27 July John Mensah accepted and signed a 2 years contract with Norwegian club Rosenborg Ballklub". Ahram Online. 8 July 2012. Retrieved 18 July 2012. ^ "Bordeaux could move for Ghana captain Mensah". MTN Football. 30 July 2012. Archived from the original on 6 January 2013. Retrieved 6 January 2013. ^ "Trabzonspor leading race to sign John Mensah". Ghana Soccernet. 3 July 2012. Retrieved 6 January 2013. ^ "Celtic switch interests Mensah". Sky Sports. 24 July 2012. Retrieved 6 January 2013. ^ "West Ham set to snap up free agent defender Mensah despite Sunderland flop". Daily Mail. 3 September 2012. Retrieved 6 January 2013. ^ "Ghanaian defender John Mensah joins French side Rennes". BBC Sport. 3 January 2013. Retrieved 6 January 2013. ^ "Ligue 1 – Ghana defender Mensah back at Rennes". Yahoo! Eurosport. 2 January 2013. Archived from the original on 13 September 2014. Retrieved 6 January 2013. ^ "RC Lens vs Rennes Lineups and Statistics". Goal.com. 6 January 2013. Retrieved 6 January 2013. ^ "John Mensah's stay at Rennes in limbo". Goal.com. 23 July 2013. Retrieved 21 March 2014. ^ "Ghana shocks Brazil 2–1 in World Youth Cup quarterfinal". ghanaweb.com. 1 July 2001. Retrieved 2001-07-01. ^ "FIFA World Youth Championship Argentina 2001, Quarter-finals: Ghana 2–1 Brazil". fifa.com. 1 July 2001. Archived from the original on 20 March 2007. Retrieved 2001-07-01. ^ "John Mensah – International Appearances". www.rsssf.com. "John Mensah Stats Page – France Football". Archived from the original on 28 November 2006. Retrieved 27 April 2007.